The big stars of cycling: the race winners stand on the podium on the inevitable three steps, waving to the crowds, kissing podium girls, throwing bouquets around and spraying innocent bystanders with champagne. But the riders on the podium are only the most visible evidence of a pro team and now a book has come out that shines a bit of light on those that never end up mentioned, unless a chain breaks at a bad moment: the mechanics. 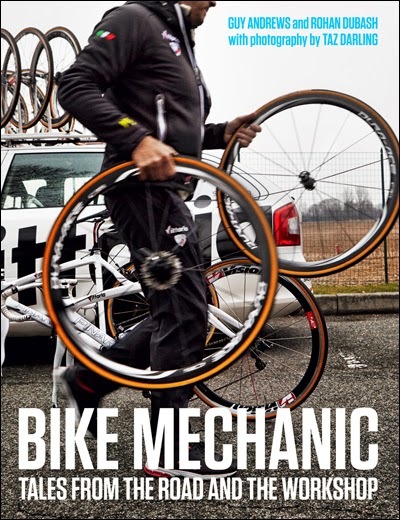 Guy Andrews' and Rohan Dubash's new book, “Bike Mechanic: Tales from the Road and the Workshop” is a welcome addition to the cycling library if only because it offers an unusual point of view. Well, it is also praiseworthy for the really good photographs, most effective in classic black-and-white, by Taz Darling. There are masses of books about celebrity racers and an impressive number that deal with famous bicycle brands or artisanal builders but nobody has had much to say about bicycle mechanics before. This book goes some way to addressing this gap but it might be better to consider it as a book about the management of the mechanical aspect of cycling. The structure of the book is unusual, with the opening section, “On the Road,” dealing with pro racing while the second section (“Hardware”) and the last (“the Bike”) move away from this to a nuts-and-bolts discussion (literally) of bicycle maintenance. The first section, which makes up less than one-third of the book, includes excellent race photos as well as short accounts of life as a pro race mechanic. This is enjoyable and illuminating. We know that the racer gets the credit when the race is won but when the race is lost through a technical failure the opprobrium attaches to the previously-ignored mechanic. The book mentions two specific cases, both involving chains: David Millar's coming apart as he was about to commence what should have been a stage-winning sprint at the Vuelta; the 2010 Tour de France when Andy Schleck's jammed at a critical moment. We learn that in the Good Old Days racers usually had only one bicycle and mechanics were freelancers who showed up at races. Today's mechanics are faced with pro teams that have upwards of 200 bicycles plus masses of spares to account for. 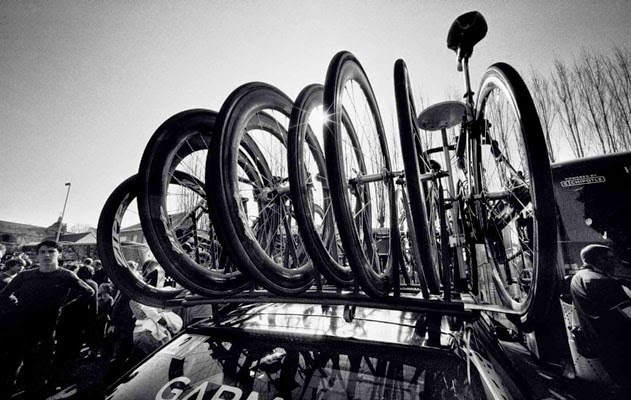 Each racing bicycle is built to the idiosyncrasies of picky pros and the mechanics need to stay abreast of this. Then during the race itself the mechanics are either moving the big truck to the next stage location or sitting in a team car, preparing to leap out for a quick wheel change or on-the-fly adjustment. When the racing is done each day and the riders off for their massages, the mechanics are busy washing, lubricating and adjusting the thoroughbred machines in time for it all to be repeated the next day during a typical stage race. 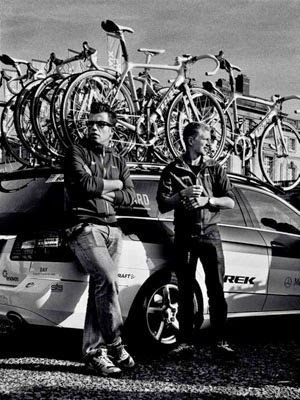 The authors have included interesting snippets of interview with mechanics, some background on the arrival of Shimano components on the European pro racing scene, an examination of a typical UCI World Tour team service course (in this case the Omega-Pharma-Quick-Step one)--laconically described as the “team garage;” a vivid description of riding along with the neutral support mechanics of Mavic and Vittoria. There is an account of the huge team trucks and their valuable contents and a chapter on bike washing. For those who have not seen pro race mechanics in action after a race it is worth staying around for the show. This writer recalls seeing the mechanics at the HEW Cyclassics race in Hamburg hosing down expensive racing bicycles at top speed and stacking them in team station wagons as if they were firewood. 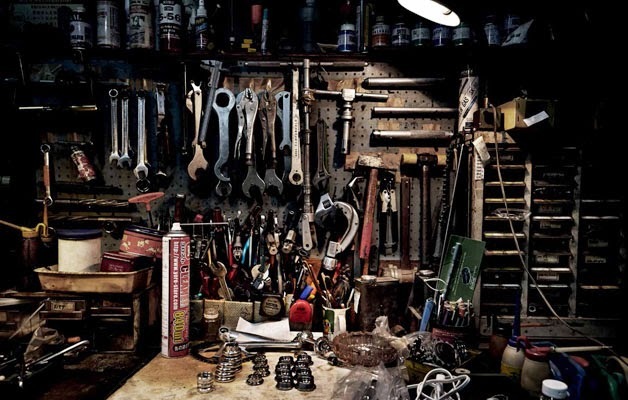 The second section of the book moves us into the esoteric world of the bicycle workshop, with its range of specific-purpose tools. The photographs are the highlight of this section and even those with no mechanical aptitude will feel motivated to at least consider doing some work if one could only get one's hands on these beautiful items. Even tools that most of us will never use (head tube facing tools, anyone?) look irresistible here. The last section of the book covers the complete bicycle and provides advice on how to maintain your mechanical steed in the same way that pros do. There are explanations and suggestions for everything from tire installation to cleaning in a clearly-written and well-illustrated fashion. However, this book is not to be confused with manuals with exploded assembly diagrams (thinking of Leonard Zinn's here) and for really specific instructions you need to go elsewhere. 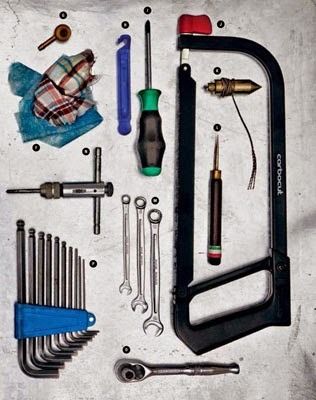 So this book is a collection of stories with some tips and hints that we thought be useful to amateur mechanics and road cycling enthusiasts alike. It certainly isn't comprehensive; there just wasn't space.....We hope it inspires you to get the workstand out. The book is a joint venture between VeloPress and Rouleur so as always the publication is of very high quality and many of the photos approach art. With the cycling season coming to an end for many of us, this is an excellent read for dark winter evenings, fun to just browse through, and would be a fine gift for any cyclist, even one with or without a workstand.